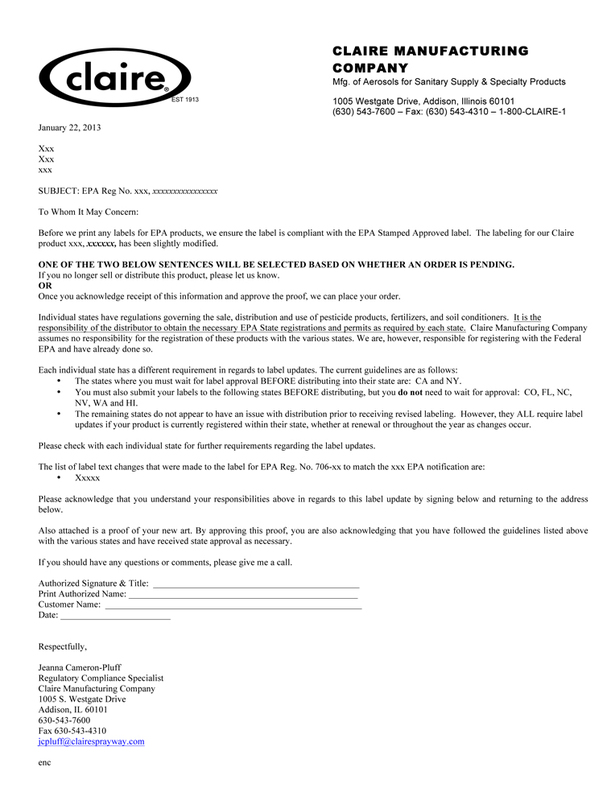 Supplemental registration allows a company to market an already-registered EPA product under its own company and brand name. 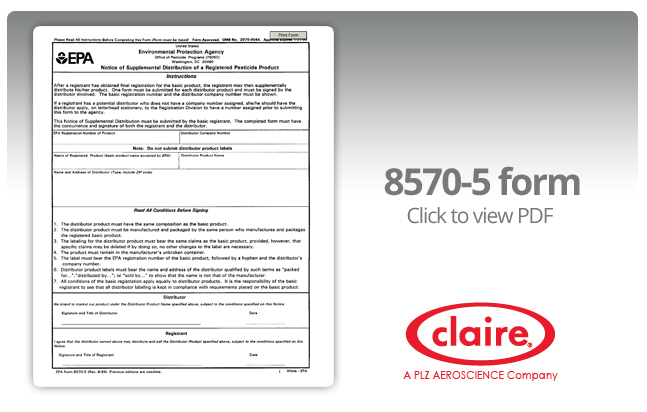 For example, Claire insecticide, disinfectant and germicidal products are available for supplemental registration using a distributor’s company name, logo, label design (within EPA guidelines) and unique product name. Two of the exceptions include the supplemental label utilizing a different product name and the supplemental distributor's name and address instead of the registrant's. Refer to Chapter 9 for detailed instructions on how to submit an application for supplemental distribution of a pesticide product. Once the product is registered in a state, your company will receive a renewal request annually. It is the company's responsibility to renew the registration annually or notify the states of discontinuance. When a company discontinues the sale of a product, whether in one state or in all registered states, it is the company's responsibility to notify each state. Each state has its own policy. Typically, discontinuance fees are the same cost as annual renewal fees. Depending on the state requirement, a company must pay discontinuance fees for 1 to 3 years. What is an EPA Company Number? A Company Number is a unique identifier assigned to a company that registers a pesticide, including insecticides, disinfectants, germicidals, with the U.S. Environmental Protection Agency (EPA). How do I get an EPA company number? Your company (the supplemental distributor) must submit a signed letter to the EPA on your company's letterhead. For complete details, click here: How to Obtain a Company Number and Register an Official Address. Please note, there are additional requirements for non-U.S .-based companies. What is the cost to obtain an EPA company number? There is no cost to establish a company number. However, when the product is registered in states where it will be sold or used, there are fees charged by each state. Where do I request a company number? How does my company report changes in company name, address or agent to the EPA? Refer to How to Obtain a Company Number and Register an Official Address for details. I'm confused! What are the steps in becoming a supplemental distributor? Don't worry! Claire will help you with the process. Contact Regulatory Affairs at RegulatoryAffairs@plzaeroscience.com with any questions you may have. What happens if my company no longer wants to sell a product in a particular state? Can I include my company's website address on the product label? If a company has their website address or a QR code on the product label, EPA considers the content of the website or the QR information to be part of the product label. The EPA can bring enforcement actions and apply potential fines if the information is not consistent with the content of the product label. To protect Claire and our customers, it is our policy to not allow website addresses or QR codes on product labels. Do I need to do 6(a)(2) reports? We place our emergency number on all the labels and have a service that handles the calls and evaluates the severity, frequency, etc... to determine if a 6(a)(2) report is necessary for a product. We will file a report if necessary. 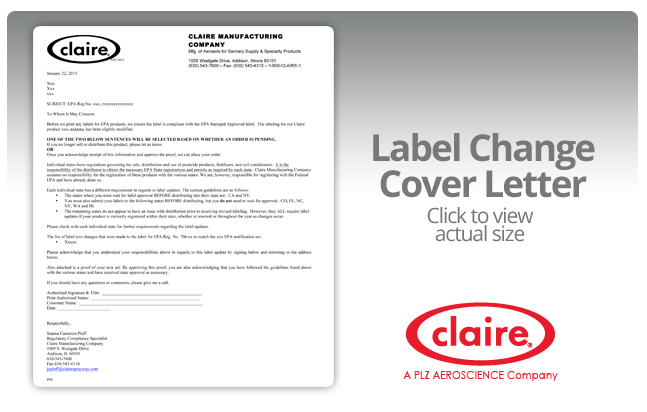 Claire Translation Policy: Whenever a translation is desired for a portion of a label, then the minimum additional translation on the label is for the name of the product on the front and the back panel hazard text to be translated. In addition it should be recommended that the principle hazard warnings on the front and the product directions on the back be translated. If there is not sufficient room on the label or if the customer does not want the principle hazard and directions translated, then the following statement must be added to the front of the label in the language and in English following it: Example "Si usted no entiende la etiqueta, busque a alguien para que se la explique a usted en detalle. (If you do not understand the label, find someone to explain it to you in detail.)" We know that this policy may not cover every situation that is possible. In the event that we encounter special circumstances we will handle them on a case by case basis. In the event that your pesticide label changes, below is the cover letter that we will send with it explaining your responsibility to notify the states. When EPA mandates a label change, then the new label must be used on product within 12 months of the mandate or at the next printing of the labels or litho cans whichever occurs first. Many times we make the label changes on demand which means when they are needed in order to print labels for a product order. As you can see from the letter above, this means that some states must be notified soon after you receive the new label.